Harley Rider? Top 10 Reasons You Need a Hot Tub! Ride a Harley? Take a look at the top 10 reasons why you need a Hot Spring Spa from Olympic Hot Tub Company and, call us today!! Floor models & demos available at BIG savings. plus our BIG Memorial Day Sale is here. Owning a Hot Spring Spa form Olympic will make every riding day better……..guaranteed! Experience deep, deep relaxation in your Hot Spring Spa after hours of riding on busy roads. Let the wide variety of jets in a Hot Spring Spa take the kinks out of sore muscles. With Hot Spring’s special jets for every muscle and ache, there’s no need to feel sore and stiff the day after a long rides. Eliminate back trouble by soaking immediately after riding. Sitting in the saddle for hours can cause your back to cramp. The heat, buoyancy of the water and the jets all keep your back healthy and pain free. Enjoy a perfect massage after every ride and, not only then, but your Hot Spring Spa is ready for you 24/7. Hot Spring Spa’s Moto Massage jet gives you a full back massage as it sweeps up and down your back. Feel a deep clean after being on the road for hours in the crystal clean waters of a Hot Spring Spa kept pristine by SilkBalance-natural water care for spas and hot tubs and the revolutionary ACE Salt Sanitizing system. Extend the riding season! The ability to get a your bones warmed up after long rides in the winter will keep you on the bike longer! Just knowing you have a hot tot tub waiting for you at the end of the ride will keep you going. You’ll get more use out of your bike. 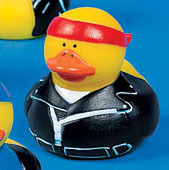 Be a kid again as you play with your Harley rubber duck. Take your duck with you on rides and send us photos of the duck’s travels. Party at your house after your ride! Convenient and fun. A great way to impress your friends! Hot Spring Spa’s entertainment system will entertain you and your guests in or out of the tub. Enjoy the outdoors year round with a hot tub and a Harley. Many, Many health benefits are associated with hot tubs/hot water. Having a hot tub could help you live longer and give you many more years of riding. And, don’t forget the most important reason to buy a Hot Spring Spa right now: Harley owners enjoy a discount towards purchase of a new hot tub or sauna at Olympic Hot Tub Company. We make it so easy to take it easy. 11 models with special financing on approved credit. Ride a Harley? You NEED a hot tub!